By Wayne G. Sayles, 208pp. hb, dj, illustrated throughout, tables, charts, maps. 1998, Krause Publications. New, signed by the author. Travel to the far-flung corners of the Roman Empire, where provincial coin makers had more freedom to celebrate their local festivals, art, games, mythology, architecture, and other beliefs on their coins. From Augustus in 27 B.C. 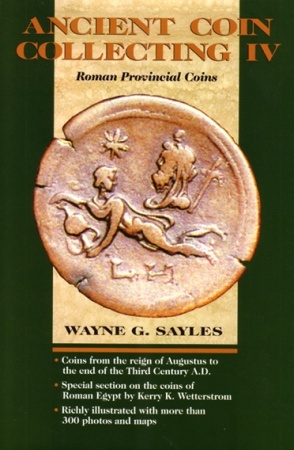 to the end of the third century, author Wayne Sayles reveals the empire of rich and diverse cultures to be found in the coinage of the provincial mints. Great for hobbyists of all levels.